the State Ticket Stands in the Regiment as follows Lincoln 338 McLellen 3 making a Republican majority of 335 This would have been much Larger if the Regiment had all been present to vote some being on detached service that could not join the Regt in time to vote. I was one of the Clerks of the Election & had to work until midnight & all day to-day to get the pool Books ready to forward to the Secretary of State. feel very much in need of Rest this Evening so will close. we are Expecting marching orders Evry day. I will write as soon & as often as I can pleas write to me often & give me all the news Love to all & Believe me Ever your affectionate husband. 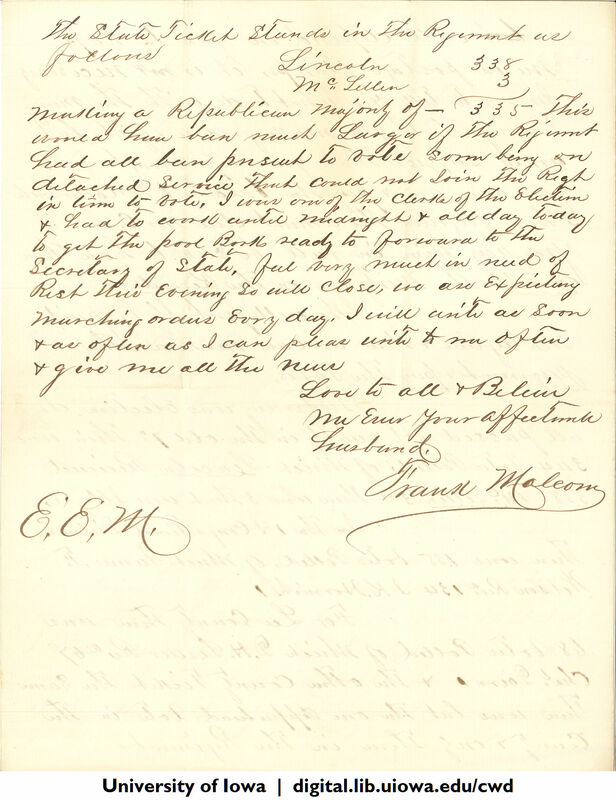 Frank Malcom E.E.M.